Americans for Legal Immigration PAC usually endorses conservative Republicans who support America's existing immigration laws instead of any form of Amnesty for illegal immigrants which only attracts more destructive illegal immigration into American. But today, ALIPAC is endorsing Phil Kurtz who is the Libertarian candidate running in the 2018 General Election against Democrat incumbent Al Green, who supports Amnesty for illegal aliens in the 9th Congressional District of Texas. There is no Republican candidate in the race. Phil Kurtz has completed ALIPAC's federal candidate survey promising to oppose DACA and Amnesty legislation that would put millions of illegals on a path to citizenship and future dominance in US elections. "In cases where we have no anti-illegal Republican candidate to face off with a pro Amnesty Democrat, we want American voters to vote for third party candidates like Phil Kurtz who are willing to stand with America's existing immigration laws instead of the Koch Brothers, US Chamber of Commerce, and George Soros, who want to change America forever by adding tens of millions of new voters who came to America through criminal means," explained William Gheen, President of ALIPAC. "Democrat incumbents like Al Green need to know that conservative voters will vote for any anti-amnesty candidate available on election day to remove them from office if they support Amnesty for illegal aliens." ALIPAC is currently unable to endorse any Democrats for public office since all Democrats now support Amnesty for illegal aliens. That being said, Democrats are more likely to be open about their desire to make illegal aliens into legal US voters while many Republicans often give lip service to the rule of law and border security while covertly supporting illegal immigrants while in Washington, DC! 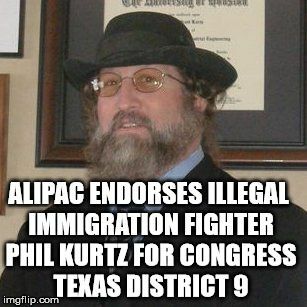 For more information about ALIPAC's efforts to endorse and support anti-Amnesty candidates like Phil Kurtz while informing US voters about lawmakers who are to blame for America's illegal immigration crisis like Congressman Al Green (R-TX), please visit www.alipac.us. Last edited by imblest; 08-02-2018 at 11:19 PM. Wow, this guy looks great! Philosophically, he is not so much a big L Libertarian as he is what I call a Liberty conservative (which is what I call myself). Don't let the Libertarian label scare you off. Check out his website https://philkurtzforcongress.nationb...m/my_positions and his blog http://libertyintexas2018.blogspot.com/ , which is very enlightening! In this endorsement you state that Al Green is a GOP candidate. I am from the great state of Texas and happen to know that Al Green is a Democrat.. (not from my district, THANK GOD!!) Thought you might want to correct this!! I can't vote for him but I pray that Kurtz succeeds in that district!!! Thanks for the heads up, texanskk57! We have corrected the press release to show that Rep. Green is an amnesty-loving Democrat! I hope Mr. Kurtz succeeds too!! Art Olivier Libertarian Candidate for Governor of Calif.